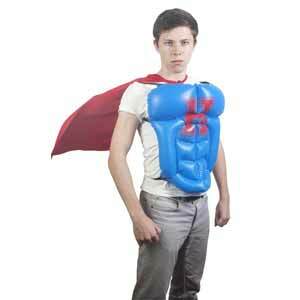 The Hero for a Day kit incorporates a hunky inflatable chest piece that’ll make you feel like you’ve spent a billion years in the gym, and a red cape for added superhero effect. A couple of years ago I was planning to go to a fancy dress party as Frankenstein. I had everything... the mask, a badly fitting blazer (which once fitted me perfectly). All I needed to complete the look was a barrel chest. I looked all over the Internet to try and find a fake one that I could place under my clothes and in the end I could only find a fake ape chest (which didn't work as advertised). If only this Hero for a Day kit had been around. To be honest, though, I don't think it's particularly well photographed in the publicity shots (see at the end of this review). While it does show you how it fits, it looks rather naff just placed over a T-shirt. To get the best results, you'll need to place it under any costume you have. So if you have a Superman suit, this will help give you a big chest, but if you plan as dressing as the super hero pictured on the box, you're probably going to get the best results by putting it on under a large shirt and then unbuttoning the top half. Dimensions: 20 x 15 x 3.5cm.